I’m not a big fan of labels. But living in Israel, you can’t really escape them – you are either religious or secular, left or right, Ashkenazi or Sephardi, Arab or Jewish (that’s a whole other discussion). If you don’t fall squarely into a category, you’ll end up spending a lot of time explaining yourself. Me? I call myself Reform (which, depending on who you ask, is akin to either “Religious” or “Secular”) and politically left. When I joined B’Lev Shalem (then ElderOptions Israel), a senior care management company, we were a small organization with a team of three: Stacey, an observant, progressive American-Jew, Amos, a secular Israeli and leftist political activist, and me. The company had a distinctly secular and “left” feel to it – both our staff and our clients. As the company grew, we hired Rachel. She was a perfect candidate: experienced, resourceful and compassionate. Rachel was religious, bringing a new dimension to our work. We had to consider how could serve our clients 24/7 when their Care Manager was unavailable over Shabbat and Chagim. At staff meetings, we served kosher-certified goods on disposable plates. We expanded, and searched for more talent. We needed someone proactive, mega-competent, emotionally intelligent and passionate about working with seniors. Someone professional and empathic, a problem-solver and multi-tasker. Someone bi-lingual and bi-cultural who could address the unique needs of a largely Anglo client base. Success! We found Karen and then Avigail. They’re religious too. Amos had left to become the Executive Director of the Jerusalem YMCA and Stacey was based in Chicago. That made us, suddenly, an almost entirely religious staff with a growing secular client base and an influx of religious clients. I looked forward to our weekly staff meetings – a gathering of strong, passionate, articulate and kind women. All of us driven by a non-wavering belief that seniors should be treated with the respect and dignity they deserve, and should have all the resources necessary to live life as fully and independently as possible. We were (and still are) an amazing team. We became more than colleagues. We became friends. We didn’t talk much about the invisible wall that divides us – religious and political. We didn’t talk about Trump’s election or the evacuation of Amona, despite the deep pain both caused for some of us. But we did talk openly, as a group, about how to manage these issues in the work context. For example, how to handle secular clients who state a preference for a secular Care Manager (it happens)? In a highly personal and boutique business such as ours, should we automatically pair a secular Care Manager with a secular client, and vice versa? Should we hire a secular Care Manager specifically to serve non-religious clients? Would that be perpetuating prejudice or meeting the needs of our clients? One Care Manager suggested that the staff should “look” less religious when they visit secular clients – they could wear a wig instead of a scarf or hat. And then Avigail stepped in: “I’ve worked in almost every geriatric setting in Israel – in Jerusalem and Tel Aviv. I can assure you that when people need care, it doesn’t matter who is giving it. What matters is that they are being taken care of with competence and compassion. A company policy was born. A policy in line with each of our values, regardless of political and religious beliefs. A policy of employing top-notch Care Managers, regardless of their ideologies, beliefs or appearance. A policy of supporting all seniors in Israel, and making staffing decisions based only on needs and expertise. A policy built on a belief that we give to each of our clients, regardless of politics or beliefs, “b’lev shalem” – with a whole heart. Today, our full staff consists of secular-right wing, secular-left wing, reform-left, religious-right and religious left. I take great pride in leading an astounding team made up of such diverse individuals. But more than that, I’d like to share how amazing life can be when we, as a nation, band together. On Friday night, November 25, 2016, fires raged across Israel, a result of terror-based arson. My news feed screamed that Neve Tzuf was up in flames. The religious community in the hills of Samaria where Avigail and her family live had been evacuated. I had never been to Avigail’s home, as she lived far across the Green Line, which I preferred not to cross. It was Shabbat, and almost impossible to get information about Avigail and her family. I was overcome with worry, and overwhelmed by a feeling of helplessness and a need to somehow participate. So, we mobilized. 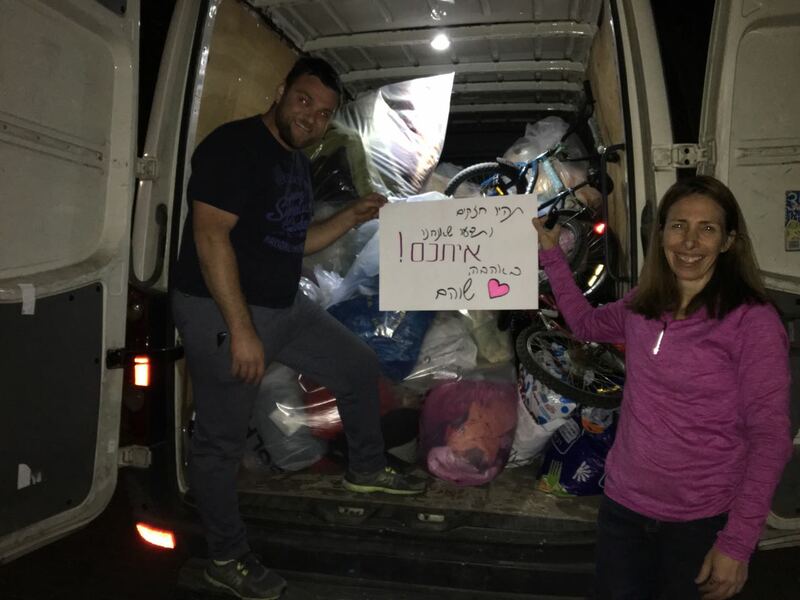 I reached out to the Reform Community in Shoham (I’m a founding member), and we turned to social media to collect necessities for those in need: clothes, toys, furniture, dry goods. Must be in excellent condition. A friend who works at UPS called in a truck. At 8:00 pm, on Motzei Shabbat, the truck was quickly filled to capacity, and headed across the Green Line to Neve Tzuf. Ours was the first load of relief items to arrive. The residents of Neve Tzuf sent photos of boxes being unloaded, tables of clothing and shoes, and hanging on the wall: our sign. At that moment, it did not matter who donated and who received. We were one. Our staff agrees: there is more we have in common than what divides us. We are all women, we are all mothers, we are all Jews, and we all care about our clients. And that which binds us, is much stronger that that that divides us.